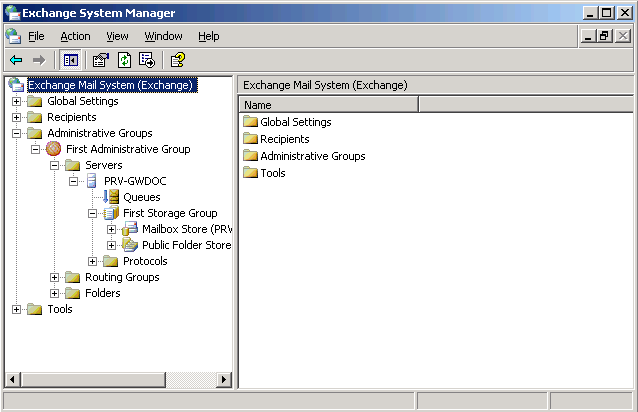 NOTE:The Exchange System Manager interface is different in Windows 2000 and Windows 2003, but the same steps can be performed in both Windows versions. HINT:If you do not see the Administrative Groups object, right-click the Organization object, then click Properties. Select Display Administrative Groups and Display Routing Groups, then click OK. Expand Administrative Groups, then expand First Administrative Group (or whatever your system’s administrative group is). Expand Routing Groups, then expand First Routing Group (or whatever your system’s routing group is). Expand Connectors, right-click the Gateway object, then click Properties. Click Modify, specify the administrator username and password, then click OK.
Click Add, select the container that contains Exchange users whose addresses and information you want to export to the GroupWise system (for example, the Users container), then click OK to add the export container to the list. IMPORTANT:Directory synchronization and exchange cannot occur if you have not added any user containers to the Export Containers property page. 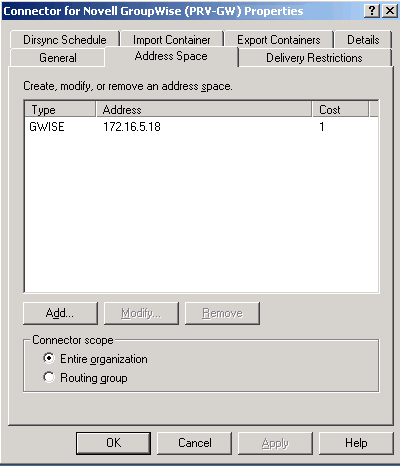 When GroupWise users are imported into the Exchange system, they are, by default, placed in a container named GroupWise at the root of Active Directory. You can use the /useimportcontainer gateway startup switch to place the users into the import container specified under Administrative Groups > First Administrative Group > Routing Group > First Routing Group > Connectors > Exchange Gateway Connector. 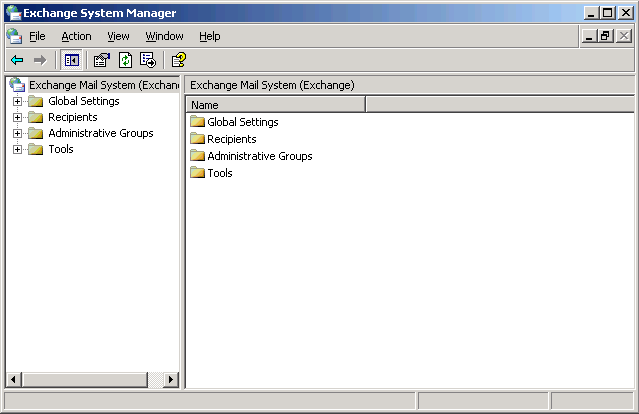 Click OK again to return to the main Exchange System Manager window. Expand Servers, then expand the Server object for your server. Expand First Storage Group (or whatever your system’s storage group is). Right-click Mailbox Store, click Properties, then click Security. Add the user to log in to the Exchange services and the Windows server (if the user has not been added already). Scroll to the bottom of the Permissions list, grant the user Send As and Receive As permissions, then click OK.
Make sure that the permissions are explicitly granted, not inherited through a parent security object. If necessary, click Advanced to verify the permissions. Make sure that the Exchange services are running. On the Control Panel, double-click Services. If any of the Microsoft Exchange services are not running, start them now. Make sure that the Startup Type field for each service is set to Automatic so that you do not need to start them manually in the future. If you want to set up bidirectional Busy Search between the GroupWise and Exchange systems, continue with Setting Up Bidirectional Busy Search for Exchange 2000/2003. If you want to customize the name of the non-GroupWise domain that represents the Exchange system, the external post office that represents the Exchange administrative group, or the format of GroupWise-type usernames for Exchange users, skip to Section 5.2.3, Customizing Addressing for Exchange 2000/2003. After performing basic configuration of the Exchange Gateway, you can configure it so that both GroupWise users and Exchange users can perform Busy Searches on each other. NOTE:Bidirectional busy search is not available for Exchange 5.5. 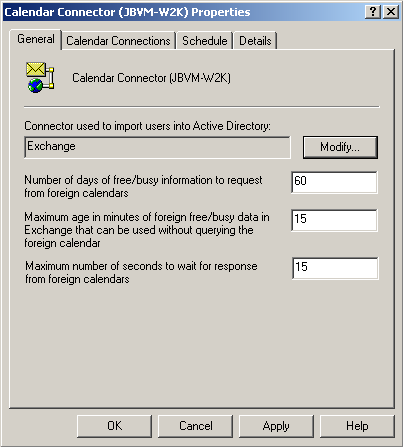 For background information about the Exchange 2000 Calendar Connector, see the Microsoft article Exchange 2000 Service Pack 1 Calendar Connector. Insert the Microsoft Exchange 2000 Service Pack 1 or later CD into the CD drive on the Exchange server. Browse to the \english\exch2000\ent_spn\calcon\i386 directory on the CD, then run setup.exe. When the Setup program appears, click Next. Select Full installation including required Schema updates, then click Next. 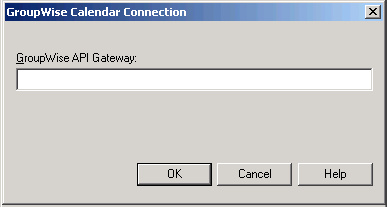 Continue with Configuring the Calendar Connector on Exchange 2000. 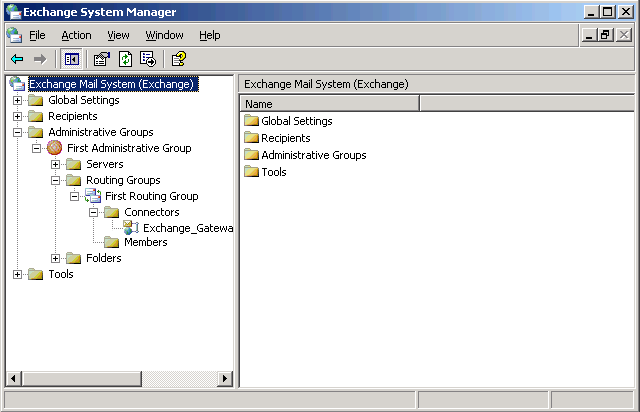 In Exchange System Manager, expand Administrative Groups > First Administrative Group > Routing Groups > First Routing Group > Connectors. Right-click the Calendar Connector, then click Properties. Under Connector used to import users into Active Directory, click Modify. 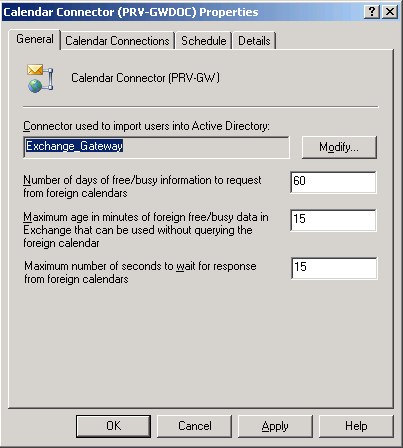 In the Name field, specify the name of the GroupWise Gateway for Microsoft Exchange connector, then click OK to display the Calendar Connector Properties dialog box. Set Maximum age in minutes to 0. The 0-second setting causes a free/busy request to come through the gateway for every refresh. If you change to a larger number, Exchange caches free/busy requests for the specified number of minutes. Set Maximum number of seconds to wait to 60. The 60-second setting prevents the gateway from quitting too soon as it waits for responses. You can customize these settings as needed for your Exchange system. 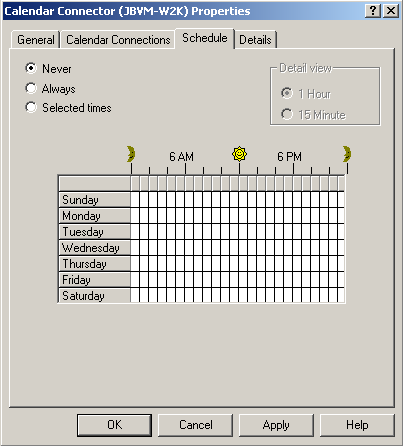 If there is not a Novell GroupWise type already listed, click New, select Novell GroupWise, then click OK to display the GroupWise Calendar Connection dialog box. In the GroupWise API Gateway field, specify domain.exchange_gateway, then click OK. This provides the name of the Domain object and the name of the Exchange Gateway object. Select Always, then click OK. Skip to Checking GroupWise-Related Windows Services. Insert the Microsoft Exchange 2003 CD into the CD drive on the Exchange server. If the CD autoruns, ignore the installation page that appears. Browse to the \setup\i386 directory on the CD, then run setup.exe. Click the check mark in the Action column for Microsoft Exchange, then select Change from the drop-down list. Click the check mark in the Action column for Microsoft Exchange Messaging and Collaboration Services, then select Change from the drop-down list. 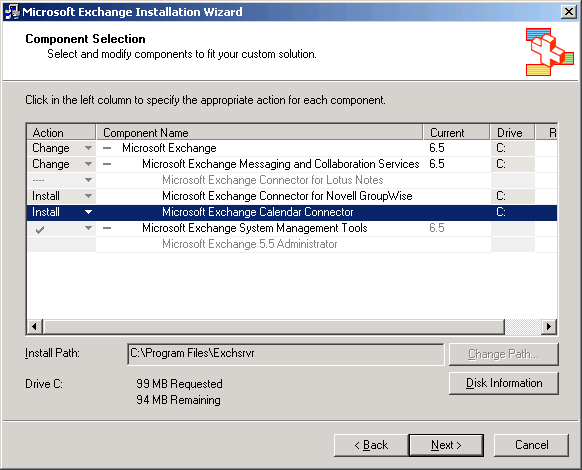 Click in the Action column for Microsoft Exchange Connector for Novell GroupWise, then select Install. Click in the Action column for Microsoft Exchange Calendar Connector, then select Install. Continue with Deactivating the Microsoft Connector for Novell GroupWise. 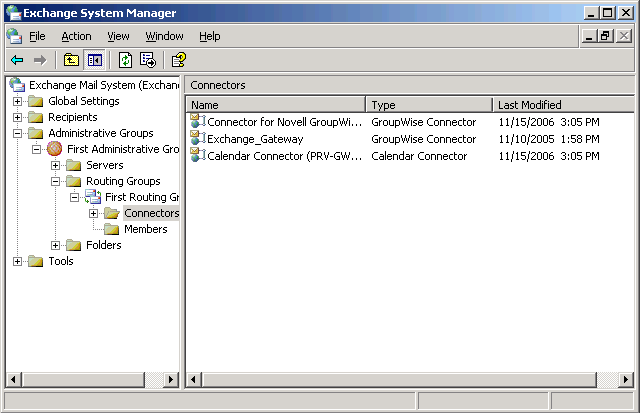 The Exchange Gateway does not use the Connector for Novell GroupWise provided by Microsoft. Right-click Connector for Novell GroupWise, then click Properties. In the API Gateway Path field, specify a valid path in order to activate the other properties. The Exchange Gateway does not use the Connector for Novell GroupWise provided by Microsoft, so any valid path is sufficient. Select the GWISE address space, then click Modify. In the Address field, change the address space to NotUsed, then click OK. The bidirectional configuration for Busy Search does not use the GWISE address space that is set up when you install the Exchange Gateway. 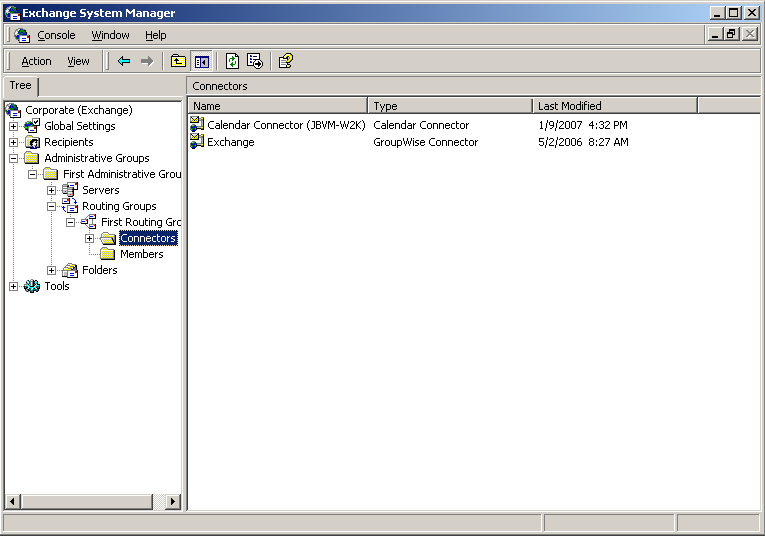 Continue with Configuring the Calendar Connector on Exchange 2003. In the Connectors list, right-click Calendar Connector, then click Properties. In the Enter the object name to select field, specify the name of the GroupWise Gateway for Microsoft Exchange connector. Click Names to verify that you typed it correctly, then click OK to display the Calendar Connector Properties dialog box. Continue with Checking GroupWise-Related Windows Services. On the Windows desktop of the Exchange server, open the Control Panel. Double-click Administrator Tools, then double-click Services. Right-click Microsoft Exchange Connector for Novell GroupWise, then click Properties. If Startup Type is set to Automatic, change it to Manual. The Microsoft Exchange Connector for Novell GroupWise is no longer needed and should not be started when the Windows server restarts. If the Microsoft Exchange Connector for Novell GroupWise is currently running, click Stop. Click OK to save the new settings for the Microsoft Exchange Connector for Novell GroupWise. Right-click Microsoft Exchange Calendar Connector, then click Properties. Click Start, then click OK.
Right-click Microsoft Exchange Router for Novell GroupWise, then click Properties. Click File > Exit to close the Services window. If this is a new installation of the Exchange Gateway, skip to Testing the Bidirectional Busy Search. If this is an update installation of the Exchange Gateway, continue with Resynchronizing Users. If you are updating your Exchange Gateway with Support Pack 1, you need to resynchronize users. In order to ensure that the Address Books of both systems are synchronized and contain valid addresses, you delete the existing user information so that it is refreshed automatically with the new configuration that you have just set up. Delete the GroupWise users that currently display in the Exchange Address Book. Expand the Exchange server object. Delete all the users from the folder. Delete the Exchange users that currently display in the GroupWise Address Book. In the GroupWise View in ConsoleOne, select Users in the drop-down list at the top of the window. Expand the External Domain object that contains the representation of your Exchange system. Select an External Post Office object that represents an Exchange site or administrative group of your Exchange system to display the users in that post office. Delete all the users, then delete the External Post Office object. Repeat Step 2.c and Step 2.d for each External Post Office object. Delete the External Domain object. Make sure that directory synchronization is enabled. Browse to and right-click the Exchange Gateway object, then click Properties. Click GroupWise > Optional Gateway Settings. Make sure that Directory Sync/Exchange is set to Both. Start the Exchange Gateway, as described in Section 7.1, Starting the Exchange Gateway. A fresh user synchronization automatically takes places between the two systems and bidirectional Busy Search is now available. Continue with Testing the Bidirectional Busy Search. Create a new meeting request for a GroupWise user. Click Attendee Availability in the new meeting re quest. You should see the schedule of the GroupWise user. 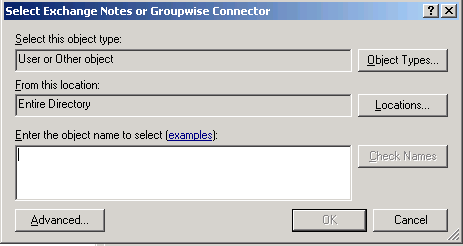 Select a time, then send the meeting request to the GroupWise user. In the GroupWise client of the user to whom you send the meeting request, accept the meeting request, then create an appointment for an Outlook user. Click Busy Search in the new appointment. You should see the schedule of the Outlook user. 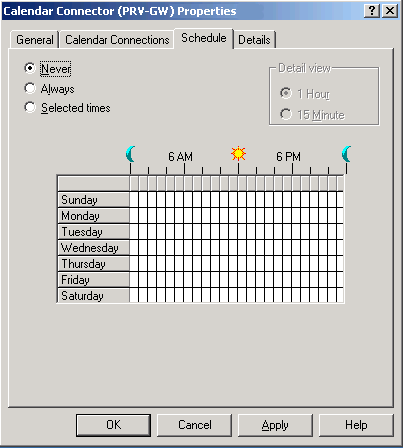 Select a time, then send the appointment to the Outlook user. If you can perform these tasks, then bidirectional busy search is set up correctly. If you want to customize the name of the non-GroupWise domain that represents the Exchange system, the external post office that represents the Exchange administrative group, or the format of GroupWise-type usernames for Exchange users, continue with Customizing Addressing for Exchange 2000/2003. Skip to Section 6.0, Configuring the GroupWise Side of the Exchange Gateway. 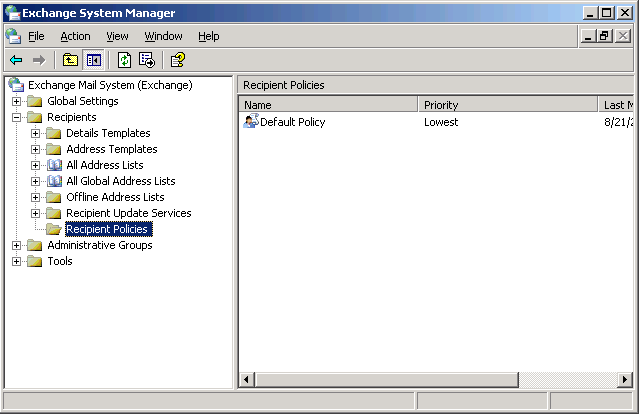 In Exchange System Manager, expand the Recipients container, then select the Recipient Policies container. Right-click the Default Policy object, click Properties, then click the E-Mail Addresses (Policy) tab. If no GroupWise-specific address type appears in the list, then the addressing components have not been installed on the server. 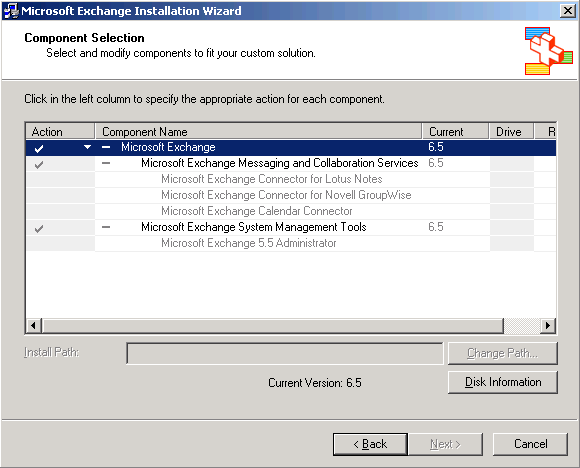 See Section 4.4, Installing the Exchange Gateway Addressing Components. Select GWISE (or your custom address type for GroupWise), then click Edit. In the Address field, the three parts of a GroupWise address (domain, post office, and username) are separated by periods. The displayed default is Exchange_organization.Exchange_administrative_group.address_format_variable. To change the name of the non-GroupWise domain that you want to represent your Exchange system, replace the Exchange organization with the domain name you want to use worksheet item 12). To change the name of the external post office, replace the Exchange administrative group with the post office name you want to use (worksheet item 13). To change the format of the GroupWise usernames that will be generated for Exchange users, replace %m with the desired address format (worksheet item 14). Back on the Default Policy properties dialog box, click OK again to save the address format, then click Yes to update all corresponding recipient e-mail addresses to the specified format.